Brick Town Talk: Inspiration of the Day - 11/13/11 - LEGO Town, Architecture, Building Tips, Inspiration Ideas, and more! 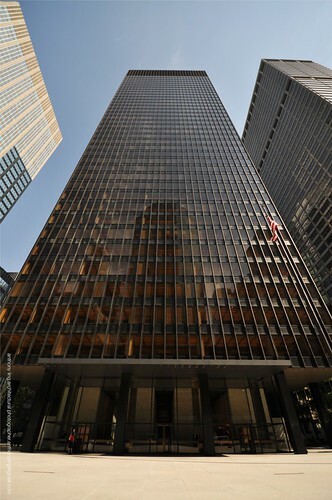 New York, New York - (BTT) A triumph of the International Style, design architects Ludwig Mies van der Rohe and Philip Johnson not only built the most expensive skyscraper in history up until that point with their Seagram Building, completed in 1958, but also the most influential. Featuring floor to ceiling windows (the first office building in the world to do so), exposed I-beams on the facade, and a public plaza that people actually want to spend time in, the building was an instant hit that lead to more copycats than anything else erected after the war. Despite being a modernist building through and through, the proportions and detailing is still deeply rooted in classical architecture, and even the lobby pays homage to last week's Inspiration directly across the street. You're very welcome. I try to give a little background to the Inspiration posts for my own amusement, so all the better if I can get others interested in these buildings as well!